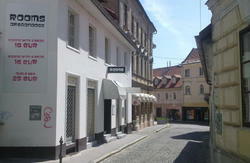 Welcome to the first private hostel in Ljubljana. Voted in the TOP TEN hostels worldwide in June 2005 and June 2006 and again in October 2006! TOP RATED HOSTEL in Europe for 2007! TOP RATED HOSTEL for 2008! Voted 8th hostel in eastern Europe in June 2009! The Fluxus hostel is situated in the heart of the city centre. It is within a short walking distance (less than 5 min.) from all the major tourist attractions, including the Parliament, department stores and numerous other shops, banks, the Cankarjev dom cultural and congress centre, the Opera house, several theatres, galleries, museums and bars. Nearby you will also find all kinds of restaurants (Slovene, Italian, Mexican, Greek, Thai, sea food, sushi, Indian, Turkish, Bosnian ...). Free towels & bed linen, free internet & wifi. No extra costs, it's a full price and incl. all taxes and VAT. We hope to welcome you in the Fluxus hostel and look forward to your visit. We are happy to welcome young and open-minded guests. Please note: the reception is open until 8 pm. We wait for guests 2 hours longest. In case they don't arrive until 10 pm, we consider that as a no show and we charge the 1st night as the cancellation policy says. In case you already know you'll be arriving later than at 10 pm, please inform us about that. ARRIVAL TIME IS VERY IMPORTANT FOR US. May we ask you to let us know (through mail or phone) if you will come sooner / later than your planned arrival. 2 Hours after your original arrival time, we will need to cancel your booking. If you don't cancel 24 hours before your time of arrival we will charge you your first night. Take a look at our SPECIALS for special offers! Arrival time is VERY important for us. May we ask you to let us know (through mail or phone) if you will come sooner / later than your planned arrival. 2 hours after your original arrival time, we will need to cancel your booking. 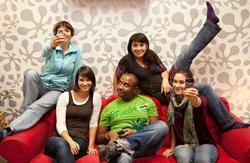 The Fluxus hostel is situated in the heart of the city centre next to Nama department store. You can take a public bus to Ljubljana Bus Station (avtobusna postaja), this will cost you 4,1 one way. You can also take the 'Markun prevozi' private shuttle. It costs 5 to the Bus station or 9 directly to our hostel. Our hostel is within a 10 minutes walk. From the station take exit 'center' and go right to Slovenska cesta. Go left and walk to Zara and Nama stores. After Benetton go right. There we are: first house on the right side of the Tomsiceva ulica (street). Number 4. Our bell is not on the list, please ring the special white one on the front wall. After 7pm, please push the right door after ringing. There is 'Dia (photo) studio' on the main floor, we are in the same house on the 2nd floor. You can take a taxi for about 3. Taxi should drive left on Slovenska and leave you at small black news-stand kiosk after Nama and Benetton store and you should NOT pay more than 5. You can also take the bus No. 2 (Nove Jarse) or 9 (Trnovo) or 27 (NS Rudnik) and get off at the third station 'Konzorcij'. The hostel is 10 steps back. Buy Urbana bus ticket for 2 + money on it (like oyster in London). Use of vignettes is obligatory for all vehicles with the permissible maximum weight of 3,500 kg (the current first and second toll-rate category) on motorways and expressways in the Republic of Slovenia as of 1 July 2008. It costs at least 15. You can buy vignette at most gas stations before entering Slovenia, or directly after the border at Petrol or OMV gas station. *** 10 minutes walking away it is possible to park a car in the street for free.